-Yan Song: The Othello game in the English electronic dictionary. The explanation of the game in the electronic dictionary. I was 19 years old. -Ben Seeley: Someone gave me a board as a gift, he had played the game at MIT. I was 12. -Nicky van den Biggelaar: In 2001 (age 14) I started playing online on a dutch gaming website where I used to play darts. My first live tournament (9th dutch open) was in 2002. -Imre Leader: I was 17, and my friend Jeremy Rickard and I began to play a bit – this was 1981. 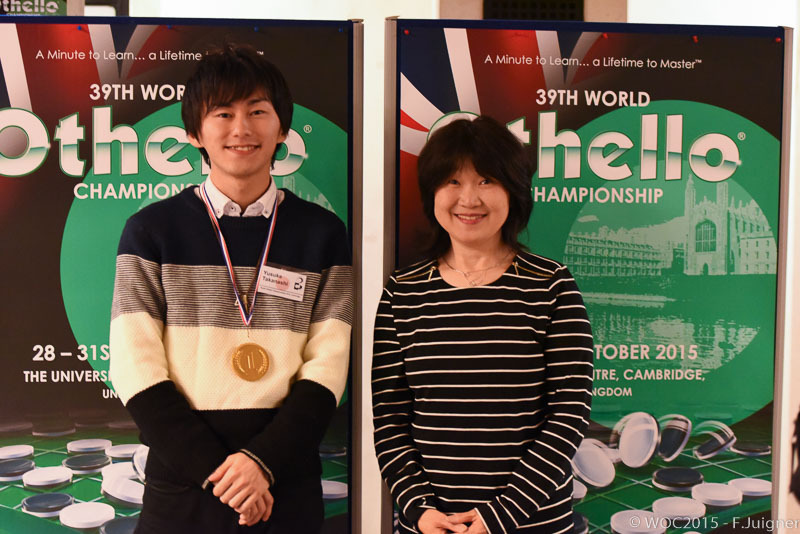 -Yusuke Takanashi: I was probably four or five years old when I first played Othello with my family. When I was thirteen I started playing on my mobile phone. The application was quite good and I lost many games. I hate to lose and this experience hooked me into Othello. -Hisako Kinoshita: I have been working in finance and accounting division. -Ben Seeley: Well, my grandfather was a mathematician and helped program and iterate some of the first computers, but I am neither of those things. My background is somewhat random, but I mainly focus on editing and writing now. -Nicky van den Biggelaar: I studied and worked in Real Estate and played a lot of poker. At the moment I am working in a restaurant. -Piyanat Aunchulee: I’m admin (Make report and manage document) .. and I finding to change job. -Yusuke Takanashi: I am a salesperson for a firm. What are 1 or 2 easy things any player, advanced or beginner, can do to improve their game? -Yan Song: To play more othello games on the real board.To take part in more othello competitions. ​-Hisako Kinoshita: I would recommend to learn opening books and find favorite opening books. -Nicky van den Biggelaar: In the opening you should try to have fewer discs than your opponent, occupy the center of the board and avoid taking edges too soon. It should give you control of the mid/late game. -Imre Leader: Play a lot. That is the most important way to get good. -Piyanat Aunchulee: Play a lot and join real on the board tournament (not count ONLINE tournament). -Yan Song: Brian Rose, wrote a great othello book. Matthias Berg, invented XOT. -Hisako Kinoshita: Hideshi Tamenori developed modern opening books that is still loved by players. Also he left lots of great transcripts. -Ben Seeley: I think Tetsuya Nakajima has not gotten as much credit as he deserves. He is not only a strong player, he also did so much which promoted the game. He directly and indirectly helped many Japanese players to become extremely strong. He created a game site, teaching videos, trained students, hosted innumerable tournaments, provided funding, created a fun environment, runs the popular daily quiz, posts news and announcements, sends in tons of transcripts to Thor, etc. He is a marvel. I also heard from good sources that Masaki Takizawa was perhaps the first player to be strong on the level of the top modern players, starting back in the mid 80s, and he did a great deal to help teach high-level Othello to other Japanese players. I think many French players must also be saluted- Emmanuel Lazard, Marc Tastet, Stephane Nicolet, etc., for creating resources which are used all over the world , ike the Thor database and the WOF ratings list, the program Cassio, providing funding for Othello tournaments during rough patches, etc. And in the USA we have David Rockwell, who I think has hosted more tournaments than anyone else in the history of North and South America, and is an all around swell guy to boot. -Nicky van den Biggelaar: For me it was Jan de Graaf who created the Dutch Othello Federation (NOV). -Imre Leader: Takeshi Murakami, by talking a lot to the Western players and coming to tournaments in Europe and generally being wonderful. Before that, Bernard Daunas, who did so much for the French Federation – and the French were the prime movers in the progress of European players. -Yusuke Takanashi: Tetsuya Nakajima. He is an excellent player, of course, but what’s amazing is his constant and long-lasting contribution to the Othello community. He has been hosting tournaments in Shinagawa twice or three times a month for many years. He is running the comprehensive Othello site, Othello Japan!. He has developed many useful applications. Among them Analysis COBRA and Endgame COBRA are especially helpful. Without them I would not have become World Champion. I am immensely grateful to him. Hideshi Tamenori. We cannot talk about the progress of Othello without talking about him. One of his great accomplishments is that he developed many openings which are still viable today, without the help of computers. -Yan Song: ​Won the 2016 Beijing Open. -Hisako Kinoshita: I qualified for the team by winning the qualifier match for women players at the Ouza-sen.
-Ben Seeley: By winning the USA National Championship. -Nicky van den Biggelaar: With my 2nd place in the Dutch Grand Prix behind Roel Hobo. -Imre Leader: Winning the UK championship. -Yusuke Takanashi: I won the 11th Ouza Tournament. -Yan Song: ​Improve physical ability and sleep condition through running. -Hisako Kinoshita: I solve end game puzzles and play with other players in Internet. -Ben Seeley: So far it's mostly been goofing off, which sometimes works fine :). I hope to do more closer to the tournament. -Nicky van den Biggelaar: Practice openings and play online (blitz) games. But unfortunately I haven't had much time yet. -Imre Leader: Hmm. Good question. I hope to find some time to prepare some openings. -Piyanat Aunchulee: Can I change question to did you have time for prepare ? haha xD. I didn’t have a time to prepare for WOC this year .. Many work come to me and that’s reason I finding to change my work. -Yusuke Takanashi: I started working in April this year, so I don’t have as much time for Othello as I did when I was a student. Also I qualified for the WOC only quite recently, in September. As a result I haven’t been able to do much, but I am catching up, mainly by playing in as many tournaments as possible. I will play at the 100th Kanagawa Open on October 30th, too. Assuming you make it to the semi-finals, name the other three. What’s so special about these three? -Yan Song: ​Yongzhi Lang, my best teammate.Yusuke Takanashi, the best player in the world. Ben Seeley, the best player in the world when he is on form. ​-Hisako Kinoshita: I guess Joanna William, Zhen Dong and someone else will enter the women's semi-final. -Ben Seeley: Yusuke Takanashi = consistency, and obviously an unblemished record in the WOC. No other player I am aware of has played in more than one WOC and managed to make the semifinals every time. And actually he has WON every time! Nicky van den Biggelaar = he is also quite consistent, especially against me, unfortunately! -Imre Leader: Yusuke Takanashi: such impressive and deep opening knowledge. And great consistency. Ben Seeley: Makes such amazing and interesting moves. If I am lucky enough to be watching a game he is playing, it is always a treat. There is no player whose games are as interesting to watch as his, these days. Such whole-board awareness, too. Nicky van den Biggelaar: Has a beautifully simple and elegant style of play. In the way that he can take an early-midgame position, and within a few moves get complete dominance, his play reminds me a lot of the play of Tamenori. -Piyanat Aunchulee: Only Yusuke Takanashi in my list for final and 2 player ( if count me is 3 ) not big different skill everyone has chance. -Yusuke Takanashi: Yang Song, Ben Seeley and Martin Ødegård. Probably no one will disagree with my selection of Yang and Ben. They have both won World titles. I played with them at World Championships and experienced their strength in person. As for Martin, I have always thought that he could ignite his potential any time and advance to the semifinal. When I played him at a WOC I had a very difficult game. He is also such a nice person. -Yan Song: ​China.This is the strongest China team ever. -Ben Seeley: I don't think odds are good of any team unseating Japan. I think in theory team USA has a tiny chance, since I think our peak capability is good. But it's hard to say whether we are the team with the best chance- team China and others may have a better chance. -Nicky van den Biggelaar: China and Singapore are looking very strong. But it will be very hard to beat Japan this year. -Imre Leader: No team has a chance! -Yusuke Takanashi: Team Thai. With the ace player Piyanat Aunchulee at the top, all the team members seem highly skilled. We should never underestimate any of them. Every year the Thai Team has different members, which indicates the presence of a large number of serious players in Thailand. I played many tough games against Thai players, even if they came to the WOC for the first time. Who would you have loved to see play at this tournament, but is not registered? Give your reason. -Yan Song: ​Kurita Seiya. I like him with no reason. -Hisako Kinoshita: Hideshi Tamenori. He is one of star players for all othello players. -Ben Seeley: Hideshi Tamenori- he was the winner the last time it was in Japan! And he has told me he hopes to qualify for at least one more WOC, just to play it for fun. But there are many others as well, like Murakami, who I think many players wish would get to play. And I enjoy my rivalry with Suekuni, I wish I could play him in the 8x8 tournament, but maybe I will get to play him in the 10x10 tournament! -Nicky van den Biggelaar: Makoto Suekuni. He is such a nice guy and I want a rematch after losing last year’s semifinal against him. -Imre Leader: Graham Brightwell, because I want him to come out of unofficial-semi-retirement. -Piyanat Aunchulee: Hard to give answer I want to meet many Japanese player >< If i can choose one I think Kurita Seiya ..no reason. -Yusuke Takanashi: Alessandro Di Mattei of Italy. He is a good Othello player of course, but more than that I love the entertainer in him. At the victory dinner of 2009 WOC in Belgium and 2010 WOC in Italy, he hoisted me and the chair I was seated in! He also picked me up in his arms as if I were a princess. In the 24 years of my life he is the only person to have ever done that. It was such fun. I haven’t seen him since 2010. I miss him greatly. Being nerdy is good, says Chess World Champion Magnus Carlsen. How nerdy are you on a scale of 1 – 10? ​-Hisako Kinoshita: I would score 9 or 10 to myself in 10 year ago. -Ben Seeley: 8. Probably more nerdy than Magnus Carlsen, at least! -Imre Leader: I’m not as nerdy as most of my maths students, but I am much more nerdy than most people. Any other mindsport or game that you are good at? -Yan Song: ​​Sudoku and Bridge. -Hisako Kinoshita: Recently, I have started playing Go with my husband and two daughters. However, they are much better than me who still spent most of time to Othello. -Ben Seeley: ​​No, I've always been afraid of having two game addictions at once, so I've been careful to not get hooked on any other games :). But probably my fear is not well-founded... maybe I should have tried other games seriously at some point, just to see what would happen. -Imre Leader: I play a game called Go Football (alias Philosopher’s Football), which is fascinating and bizarre. -Yusuke Takanashi: Gyakuten Othellonia (iTunes Application). The basic rules are those of Othello, but it has other elements such as anime characters, HP, and Skill. You have to think about many things and it is a lot of fun. What was your most memorable game? If you were to be remembered for only one game, would you want it to be that one? -Yan Song: ​The Final game of 2014 OWC with Kenta Tominaga. -Hisako Kinoshita: Women's final of WOC 2005 with Mami Yamanaka would be the most memorable game. The move 50 turned wining game into close or losing game. I still remember how I felt on the move. -Ben Seeley: Maybe it's just because Nakajima got on my mind, but one of my favorite wins was my 33-31 win against him in the Shinagawa All-Stars tournament in 2005. I absolutely had to win this game in order to have any chance of winning the tournament, and after move 31 (when I was at -2), I had to play perfectly in order to win, with several tough moves. Even though Nakajima only made two errors of one disc each, I got every move right to survive. And then I managed to win the tournament, defeating Nakajima, Suekuni, Goto, and then Tamenori twice in a row, all in do-or-die situations. This was definitely my biggest come-from-behind ever. But it couldn't have happened without the game with Nakajima, which was high-quality on both sides. -Nicky van den Biggelaar: Unfortunately it was the third game of last year’s semi final against Makoto Suekuni. -Imre Leader: Can I pick two games? One would be my game against Karsten Feldborg in the `Karsten Unrated Nonrated Tournament ‘ in Cambridge in 1988: I am very proud of my first corner sacrifice and especially my second one. The other would be the first game of the Final of Stockholm 2007, against Makoto Suekuni. -Piyanat Aunchulee: Maybe with Yusuke round 12 WOC2010 (25-39), because I’m not believe in my ability but I can beat Japanese World Champion and that year is my first time to enter to semi-final WOC.